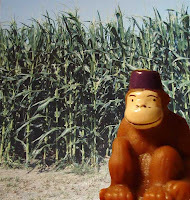 Putting the Odd In Todd: The Monkey Writes! My journeys have taken me so far from home. I have seen so much. I received your telegram about the news you received at Christmas. I am as surprised as you are that Red Fez got ahold of you. And more surprised that he's a cross stitch model. 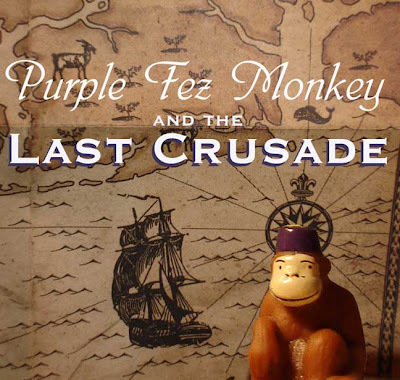 Still, I am more surprised that the cross-stitch artist left out his fez when making that picture. Weird. Anyway, I am glad to hear that Red Fez is safe. But I will not end my quest. I want to see him and make sure he is OK. For all we know he could be kidnapped and forced to write what he did in your Christmas gift. We just don't know, Todd. And so I will continue my search. When you last heard from me, I was in a land called Missouri. I sailed North on a great river to a Kingdom they call Iowa. I said to a man, "Is this heaven?" And he said, "No, this is Iowa." And then he said, "Whoa. Talking monkey!" Anyway, I then continued to sail North. After many nights, I reached some great lakes and made my way to ocean. 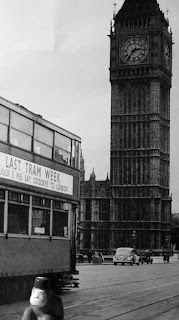 When I got the news from you I was in London (see me with Big Ben?). I took all my London photos in black and white because they look more dramatic. The funniest thing happened in London. I met a man named H.G. who owned a time machine. Don't believe me? 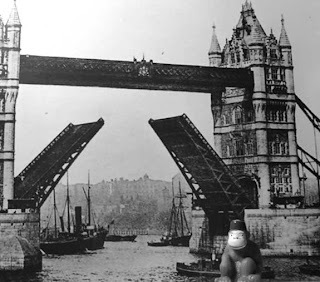 Look at this picture--it's me with the London Bridge in the 1800s! Pretty cool, huh? Anyway, upon hearing that Red Fez is now a model, I have chosen to return to the U.S. of A. I am told that many models come to New York. So here I am to find my brother. As I write this, I have just arrived to this great city. 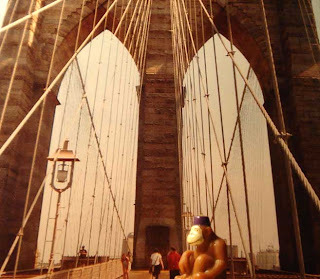 See me here at dawn standing on the Brooklyn Bridge? Well, I will continue my journey. And I will find Red Fez. ''It was only about halfway through shooting Gideon's Daughter that my costar realized that I wasn't the science guy. I've disappointed a lot of small children over the years. When my daughter first started school they wanted to meet Bill Nye, the Science Guy until they actually realized I was the other Bill. I have never actually met him. I don't know if we resemble each other.'' - Bill Nighy, the actor. Not the science guy. "OK, to be fair, the contest rules state that the Golden Nacho Awards are 'to honor the movies that moved us, inspired us, and made us think about God this year.' Maybe they were all thinking, 'Lord, please make this movie end now!' Technically, they were thinking about God in that moment" -Marc, about why people are voting for Eragon in our magazine's movie awards.